This Transitioner has been at it for roughly 7 months. We have found this to be a really great option for her to wear as she transitions. This style allows her to focus on other areas of her life as she knows her hair is taken care of for a few weeks;roughly 3-4. My client is a professional woman and role model for young women, therefore her image is very important to the public. Her look communicates that she loves herself, has self respect, but is a woman about her business; on a mission. She is communicating that she is a regal woman, commanding the respect of others. At home hair care includes gentle cleansing of the scalp. Oil sheen daily and a Leave In Conditioner spray nightly or every other night before tying up the hair for bed. this is a very low maintenance option. And the best part is that you can bring down your knots for a completely different look. Tons of versatility! Styling- Keracare Edge Tamer for braids and Keracare Twist and Define Cream for twists. Hair is then styled and the straight, relaxed ends are rolled on perm rods and set under the dryer. Viola! 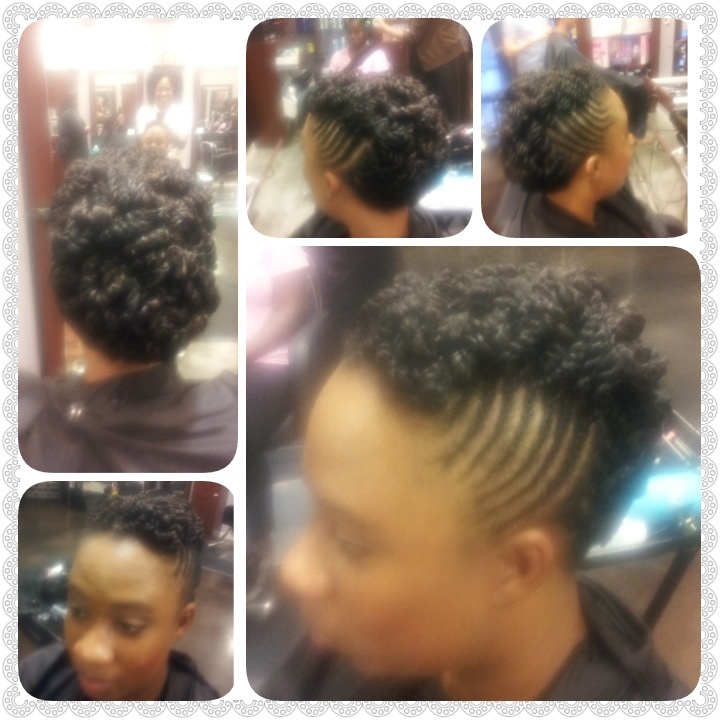 A fresh braid/twist set; propelling the natural transitioner into the free abyss of a carefree lifestyle!